- Photo by Jim Mason Harvey County West Park is an old-fashioned country park on the Little Arkansas River, at the northern edge of the Arkansas River Lowlands. The habitats are riparian woodlands, a small lake and pond, and sand prairie. 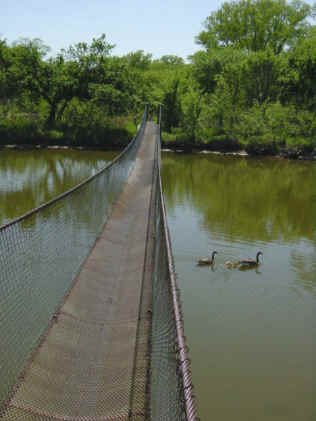 Start your visit by bouncing across the metal swinging bridge leading to the nature trails! The sand prairie is an area of sand dunes stabilized by the roots of bluestem grasses, sand lovegrass, and sandhill plum. A good diversity of wildflowers may be seen here as well. The surface-bulging tunnels of eastern moles and mounds of dirt left by plains pocket gophers are signs of mammals seldom seen. However, pleasant, moonless nights will bring kangaroo rats from the fan-shaped entrance of their burrows. In summer, gaze overhead for turkey vultures, red-tailed hawks, and Mississippi kites. Hovering and swooping over the grasses are American kestrels, scissor-tailed flycatchers, and northern harriers. Colorful dragonflies and damselflies, whirligig and diving beetles, and water skaters occupy the aquatic areas. Many kinds of amphibians and reptiles supply amusement: tiger salamanders, diamondback water snakes, spiny softshell turtles, and common snapping turtles. Other reptiles commonly seen in the dunes are western hognose snakes, plains garter snakes, slender glass lizards, and ornate box turtles. On a warm day, if you notice a lightning-quick creature scurrying away from you through the vegetation off the side of the trail, it is the six-lined racerunner lizard! View red-winged blackbirds, great blue herons, mallard ducks, beavers, and raccoons around the water's edge. In the woodlands of cottonwood, elm, hackberry, buckbrush, and rough-leaved dogwood are vireos, warblers, and thrushes. In winter Harris' sparrows, winter wrens, and red-breasted nuthatches are seen. Wild turkeys, white-tailed deer, opossums, and cottontail rabbits are always active. While in the Newton area, learn more about pioneer history and walk through a reconstructed prairie at the Kauffman Museum. Picnic tables, Shelters, Pit toilets, Swimming beach. Utility and primitive camping, permit required. Click the icon to find a birding list for Harvey County. Directions: From Newton (20 miles north of Wichita) go 14 miles west on U.S. 50 to River Park Road (Harvey County Road 793). Turn north, go 3 miles to NW 24th (Harvey County Road 566). The park entrance is about 0.8 miles east on the north side of the road.